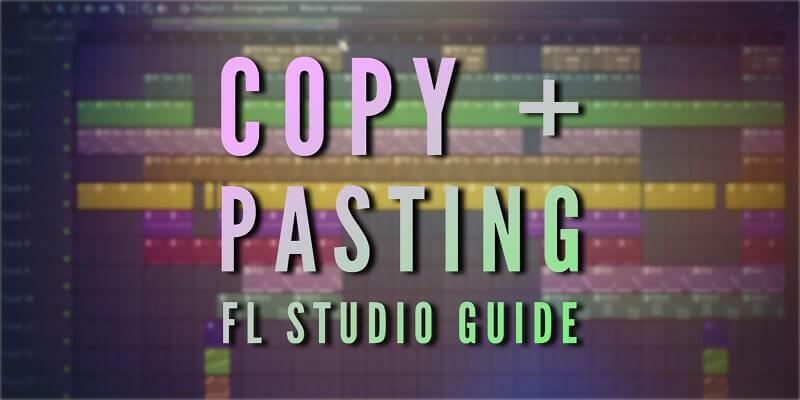 In this article we’re going to discuss copying and pasting notes in FL Studio. 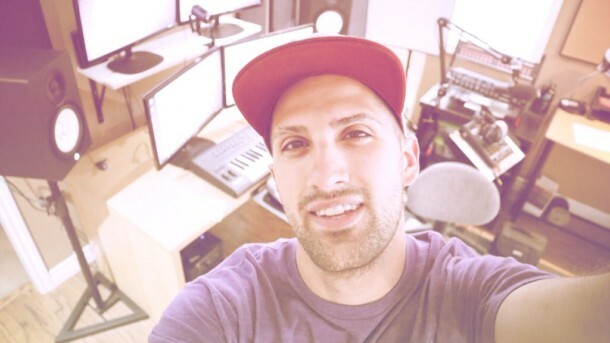 We’ll also talk a little bit about some FL Studio keyboard shortcuts and hotkeys to make the process a lot easier when it comes to working with the Sequencer, Piano Roll, native and third-party VSTs, automation clips, and I’ll quickly touch on copying presets and effects between mixer tracks in FL Studio 20. You’ll be happy to hear that copying and pasting in FL Studio is the same as Windows shortcuts! Copy CTRL + C, Cut CTRL + X, and Paste CTRL + V are all their respective shortcuts. 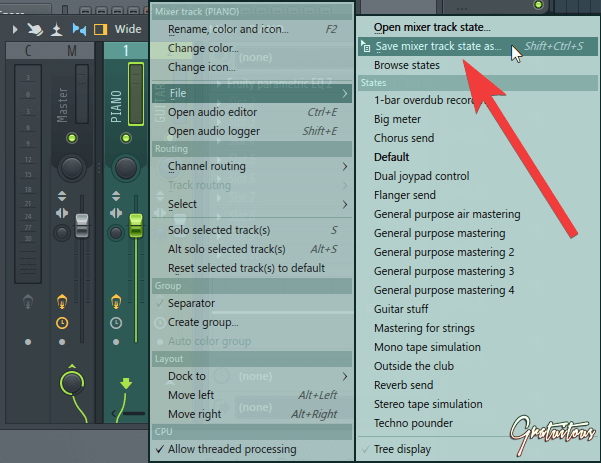 If you’re one to never use the cut shortcut, you’ll be happy to know, it’s super useful in FL Studio! – I’ll show you some tricks to speed up your workflow! Inside the sequencer, there’s a couple routes you can take to copy and paste notes from sound to sound, or pattern to pattern. We’ll start with the steps inside the Sequencer. The keyboard shortcut to open FL Studio’s step Sequencer is F6. You first must make sure you select the bar in between the sound name and the steps (where the arrow is pointing; the green bar). Simply press CTRL + C. It’s now on your clipboard, just like in Windows! 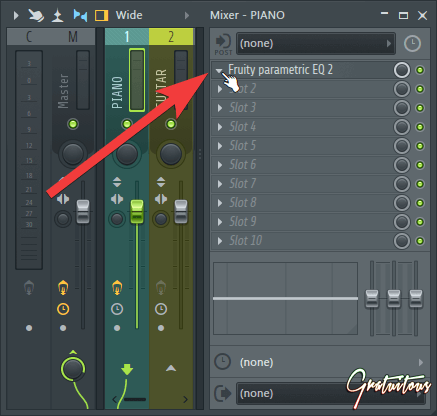 From here, you can paste what you’ve just copied into a new sound by first clicking the bar beside the sound to go green and using CTRL + V. Or you can paste the steps into a new pattern to allow for better arrangement flexibility. Now as mentioned above, I’ll show you how FL Studio goes about pasting sounds. 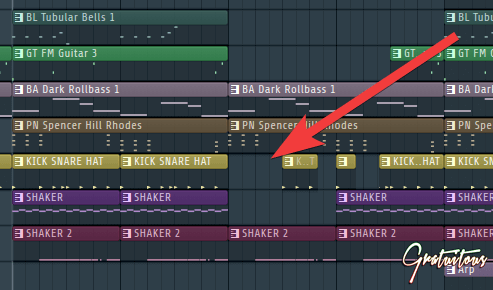 You can see that I am highlighted on the Snare sound. When I pasted with CTRL + V, the Snare sound got the drum’s notes. 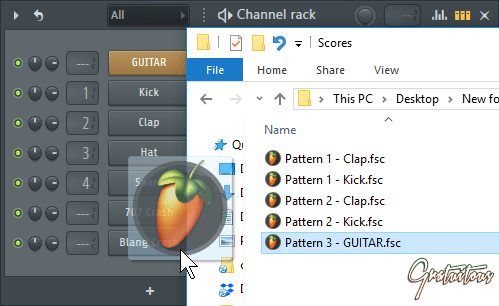 But, FL Studio has also pasted the clap’s steps into the 707 Crash sound. That’s how simple it is to copy and paste notes inside FL Studio’s Sequencer when dealing with steps, which you click in. And if you don’t like the shortcuts, there’s always the mouse way of copying/cutting/pasting. Just Right Click on a sound, and you’ll see Cut, Copy, and Paste. I often use copy + paste, and sometimes cut, when I have built a drum loop all inside one pattern, but want to break it apart later for arrangement. I find building a drum loop all in one pattern way easier to make a beat because you can just keep building the loop as a whole, not wasting time creating new patterns! But, come arrangement time, you usually don’t want all of the drum loop playing all the time. 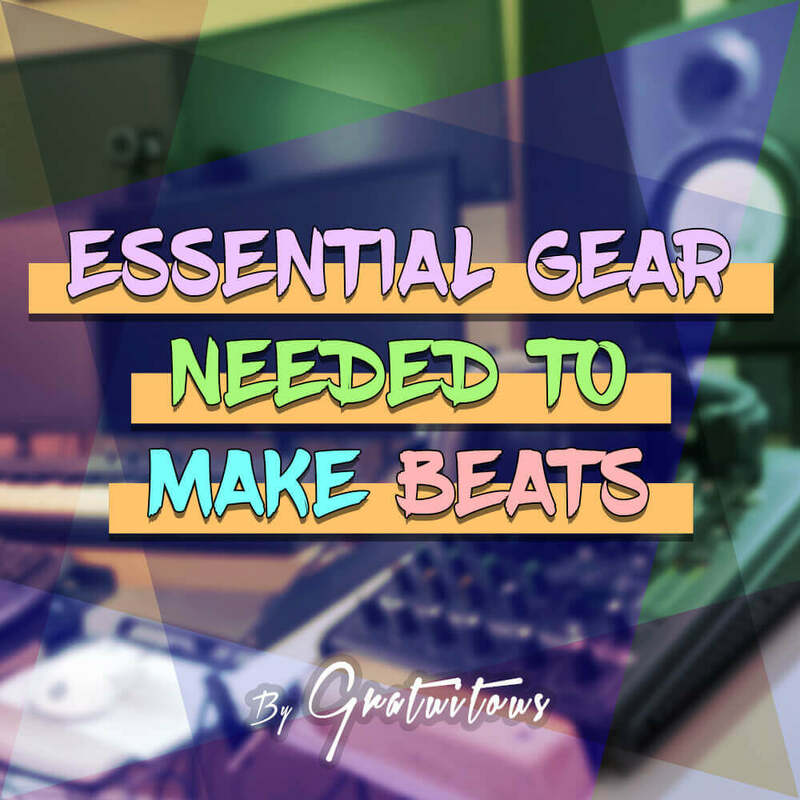 For example, maybe you have percussion sounds, cymbals, or hi-hats which you only want during your chorus. This is where we’ll take those sounds out, put them into their own pattern, and have full flexibility when building the song’s arrangement. In this song, I actually removed the two shaker sounds (which are the green MIDI notes) from the drum loop, and put them into their own pattern. This is because I only wanted those shakers to play at certain parts of the song. To do that, I’d highlight both shakers by Left Click (Hold) + Drag Down. For another FL Studio keyboard shortcut, let me introduce you to the number pad! Now if your keyboard or laptop doesn’t have a number pad, that is sad 🙁 . It truly is an amazing tool for a fast workflow. Anyways, to go to the next pattern, just push +. To go to a previous pattern, press -. (No, the + and - above [ and ] don’t work). If you don’t have a number pad and can’t use the + shortcut, here’s an image where you can see your existing patterns, or create a new pattern. Once on the new pattern, I selected the first shaker sound and used CTRL + V to paste in our MIDI notes. But in this song, I actually gave each shaker it’s own pattern for even more control in my arrangement. I would approach this by pasting in both MIDI notes of each shaker into one pattern, deleting the second shaker’s MIDI notes, then going to a new pattern, pasting in both MIDI notes again, and deleting the first shaker’s MIDI notes. Now I’m left with two new shaker patterns for ultimate flexibility in my song’s arrangement. Since we’re working with MIDI notes, deleting works a little bit differently in FL Studio. If our shakers were just the steps we’d click in, like in the previous images, I could just press del when highlighted on a sound. But since these shakers were MIDI notes within the Piano Roll, I have to open up the Piano Roll and then press del. We went to our first pattern and pasted in both shaker’s MIDI notes. We opened the Piano Roll on the second shaker, and pressed del. And not to worry if we delete – Both shakers are still on my clipboard which I cut earlier with CTRL + X. I haven’t lost my shaker patterns. I’d then go to a new pattern a second time, paste the shakers in with CTRL + V, select the first shaker’s Piano Roll, and again, press del. I now have full flexibility on arranging my song. As you can see where I’ve put the arrow, I’ve set my arrangement so my drums and shakers are playing at different times, allowing for full flexibility in my arrangement! Onto copying and pasting notes within the Piano Roll now! Dealing with the Piano Roll and MIDI notes has a different approach than the Sequencer. I usually keep my one-shot samples (drums, claps, hi-hats) as steps; it’s easier to click in when building your drum loop. As mentioned above, to delete sounds with steps, you just have to select the sound and press del. But with MIDI notes in the Piano Roll, you have to open up the Piano Roll first, then press del. But a little shortcut with MIDI notes: You can use CTRL + X to cut the sound, which gets copied to your clipboard, and removed from the pattern. But be careful if you already have a sound copied to your clipboard, it would overwrite that, and you’ll lose your pattern! But if you do make a mistake, all is not lost. 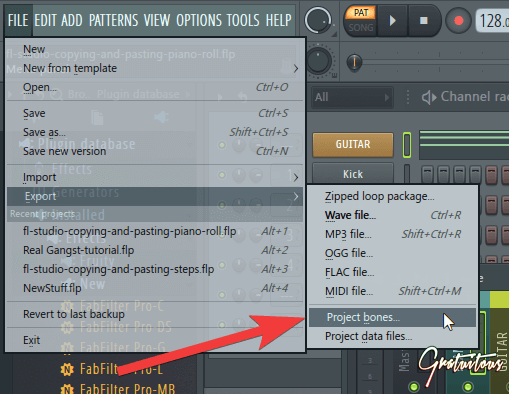 You can easily undo in FL Studio and get your adjustments and patterns back. 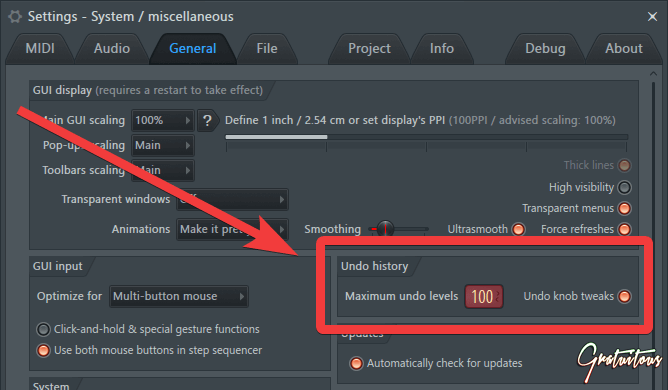 I like to have Maximum undo levels set at 100 (with Undo knobs tweaks enabled). You’ll find this menu under the General tab within Settings. The keyboard shortcut to access settings is to hit F10. I tell you that because if you’ve lost a sound you’ve cut, just hit CTRL + ALT + Z a couple times to go back in history until the sound you’ve cut comes back! Or, inside FL Studio’s browser, you can select Current Project -> History -> [Whatever Last Event You Want to Go Back to]. Okay, with those details covered, let’s tackle how to copy and paste melodies from one pattern to another within the Sequencer. MIDI notes and steps work the exact same way in the Sequencer. Select the bar beside a sound to go green, hit CTRL + C, go to a new pattern, then paste with CTRL + V into the sound you’d like. But working with the Piano Roll and your MIDI notes is a bit trickier when it comes to copying / pasting, though! 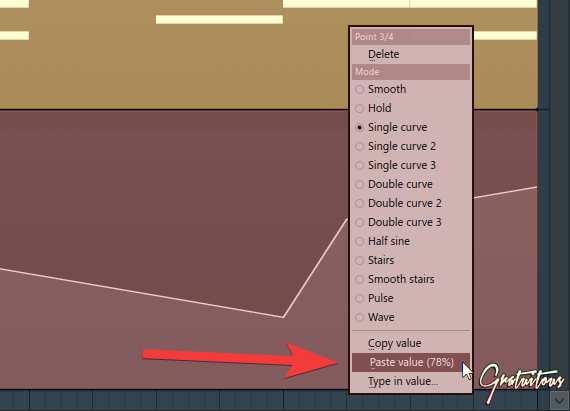 MIDI notes which you’ve copied from inside the Piano Roll will not paste into the Sequencer! You must open another Piano Roll window to paste in your copied MIDI notes. 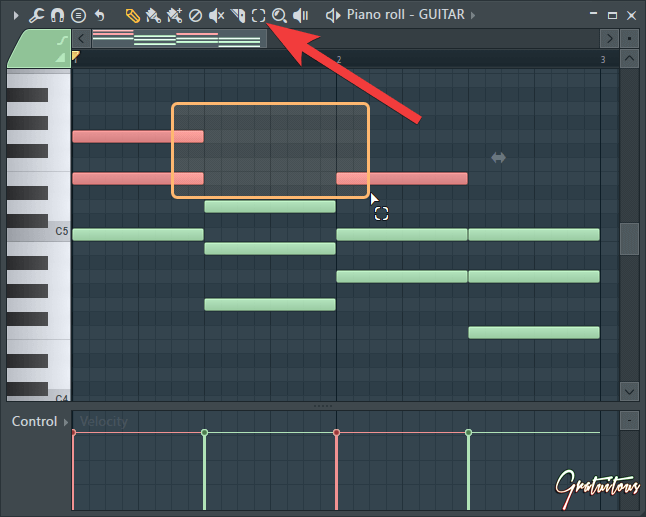 You can then use CTRL + V, or go File -> Edit -> Paste from within the Piano Roll. Left Click the green MIDI notes. Right Click on a sound and select Piano Roll from the menu. Hightlight a sound’s green bar and press F7 (Piano Roll shortcut). Once inside the piano roll, to select notes, there’s two options. You can highlight the whole playlist with CTRL + A. 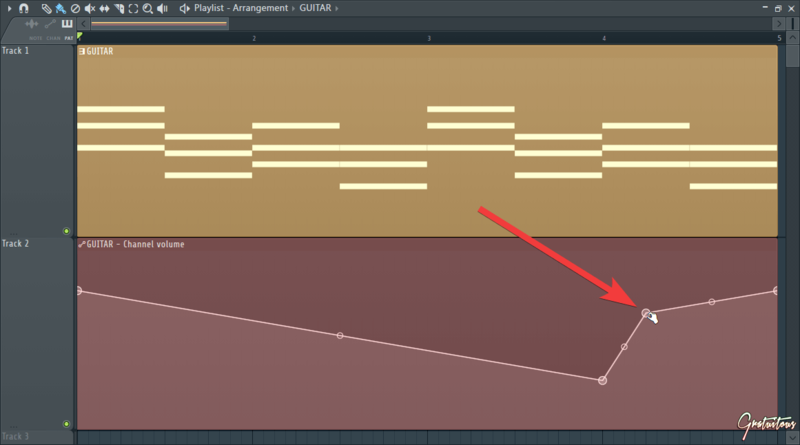 This selects all the notes within the Piano Roll, and is a cool looping feature, too. You can now simply copy or cut these notes with CTRL + C or CTRL + X. For more precise control, and how to select individual notes in the Piano Roll, you can use CTRL + Shift + Left Click on individual notes to highlight or deselect notes. If you want to drag and select many notes, use CTRL + Shift + Left Click (Hold). You can also select multiple notes, after you’ve highlighted notes by using CTRL + Shift + Left Click (Hold) again. 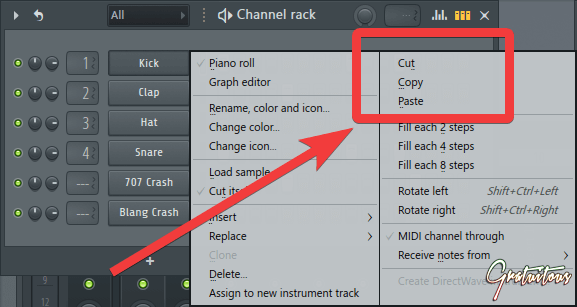 Here’s a cool pro-tip which allows you to duplicate notes to the next bar within the Piano Roll, or Playlist when arranging your song. The keyboard shortcut to Duplicate Selection is CTRL + B. 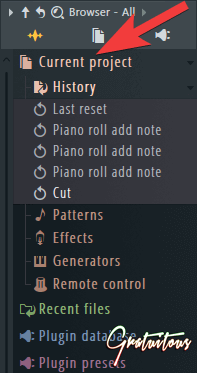 Inside the Piano Roll, I’d typically highlight the notes I want, either with CTRL + A to highlight all notes, or CTRL + Shift + Left Click to select individual notes. Once my desired notes are highlighted, I’d press CTRL + B and BAM! Your exact notes should be duplicated into the next musical bar. This trick also works with the playlist! You can highlight full sections, press CTRL + B, and it duplicates your selected tracks on the playlist to the right of the highlighted tracks. 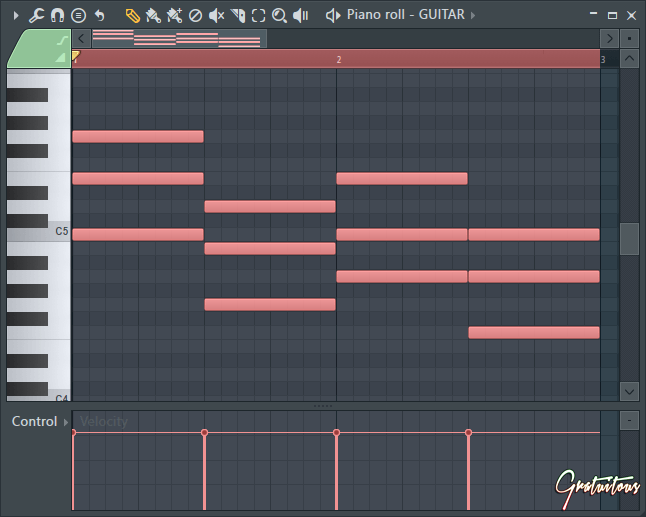 I think that wraps up copying notes in FL Studio’s Piano Roll, and pasting melodies into a new pattern. FL Studio is intuitive in many ways. Copying knobs and slider parameter values is one of those ways! Let’s say you’re working on two kick drums and you’ve turned down the volume of the second drum’s mixer insert. 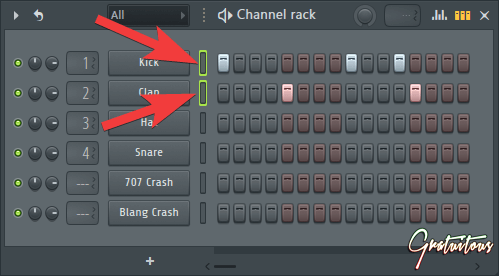 If you want the first drum’s mixer insert slider’s volume to be at the exact same position as the second, you can Right Click and select Copy. You will then go to the new mixer insert slider, Right Click and select paste. And now that VST3 is becoming widely supported, we can right click any knob within our third-party plugins to copy the value in the exact same way. 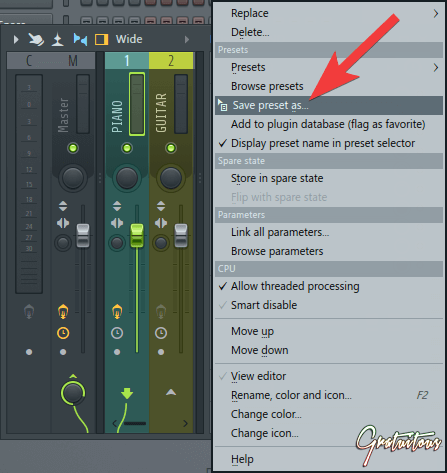 So here’s how to automate third-party VST plugins in FL Studio (or right click in them), if using VST2 versions of the plugin. It’s a little work around, but it’s what you have to do if using VST2 third-party plugins. You’ll use Tools -> Last Tweaked very often if you’re wanting to right click in the plugin to copy a value, create an automation clip, link to a controller, or anything similar through the right-click pop-up menu. I personally feel automation clips a little bit cumbersome in FL Studio, but once you understand how FL Studio handles automation clips, you’ll be sailing! 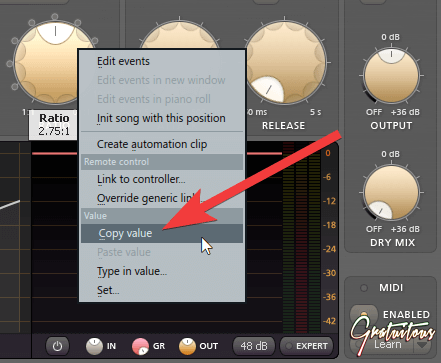 For more information, you can check out my article on copying + pasting values with automation clips in FL Studio. Let’s say you’re working on an automation clip. As your song plays, it follows your automation clip. Whatever values you’ve adjusted, FL Studio will automate that parameter. But here’s a real-world situation that happens to me quite often. 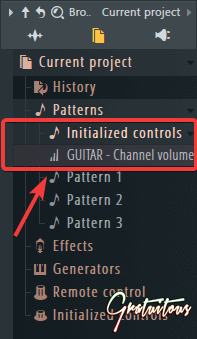 When creating an automation clip in FL Studio, it stores a snapshot in Current Project -> Patterns -> Initialized controls. 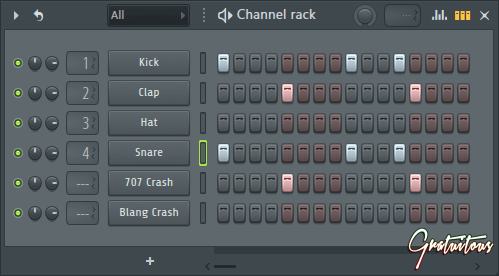 When I say snapshot, I mean FL Studio saves the initial value of where the parameter was at when you created the automation clip. 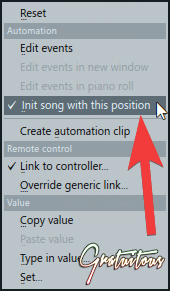 This means if you adjust the automation clip to have a different value than at the beginning of the clip, and you put the playlist cursor at an earlier point in that song of that automation clip, it will default to that initial value. So here’s the quirk, and how I work efficiently with it. 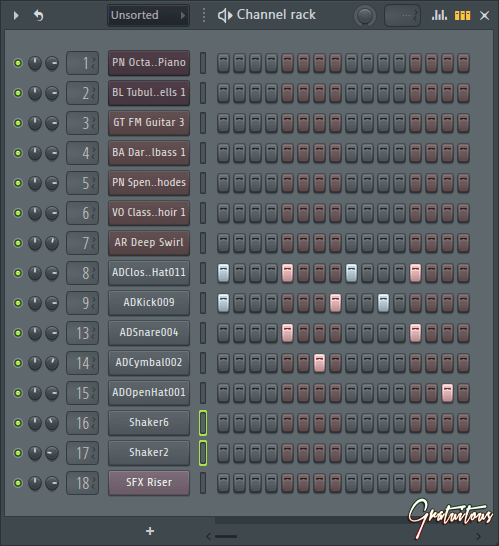 I’ve created my automation clip in FL Studio, which saves a snapshot of my initial parameter’s position. Now I want to be creative and tweak this automation clip halfway through to give my music some movement and emotion! Well, sure – I can just Right Click on the automation clip’s line, it will create a new point for me, and I can simply Left Click (Hold), and drag it to where I want. But what if I want my automation clip to go back to its initial value half way through the clip? 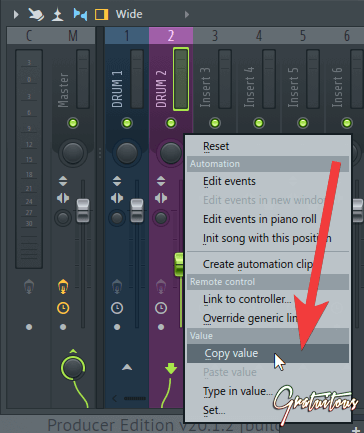 Or, what if I’m extending the automation clip to be longer in length and I accidentally move the end point up or down from its original value? Well, to extend, you can hold down Shift, and that restricts vertical movement. So that one’s easy. But making the automation clip go to it’s initial value in the middle of an automation clip after I’ve already increased or decreased the automation clip is super tedious by mouse! In this image above, where I have the red arrow, if I want to make that automation point the same value as at the beginning, again, using the mouse is tedious. Simply hover your mouse over the first automation point, Right Click, and select Copy from the pop-up menu. You can now hover your mouse over the automation point again, Right Click, and paste it in! Simple. No more tedious tweaking with the mouse struggling to adjust just that extra 1% so it’s the same value as the initial position! The keyboard shortcut to open up FL Studio’s mixer is F9. 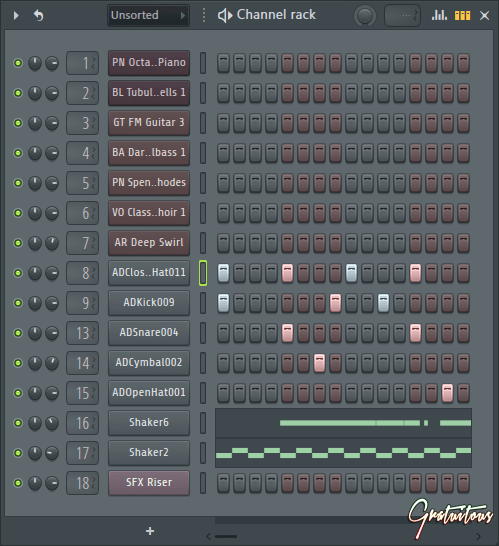 FL Studio has a unique approach of copying effects between mixer channels. In addition, you can also duplicate one mixer insert to another, too. The feature to copy plugins between mixer inserts is Save preset as. The feature to duplicate whole mixer inserts is Save mixer track state as. Inside the mixer, click on the insert where the plugin you want to copy is. 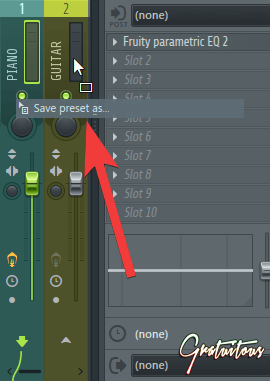 You can simply Left Click (Hold) and drag Save preset as onto a new mixer insert. In addition, you can actually Left Click on Save preset as to actually save the preset if you’d like to recall the plugins’ state at a later date. 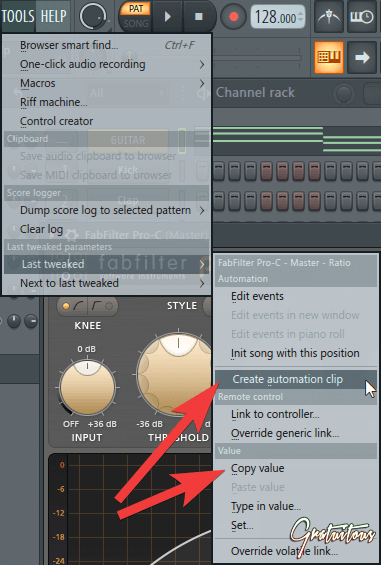 If you want to copy the whole effects chain, from one mixer insert to another, you right click on the actual mixer insert, not the individual plugin. On the mixer insert, it’s under File -> Save mixer track state as. And that’s all it takes to copy and paste effects between mixer channels in FL Studio. Also, how to clone mixer inserts. The easiest way to work in between projects is with Project bones. You’ll find it under File -> Export -> Project bones. Make sure to export this to a new folder to keep yourself organized. Inside the files, you’ll want to open the Scores folder. A simple method I used to use when I only wanted to one instrument’s MIDI notes was to open the first project, hit CTRL + C to copy, then open the new project and paste with CTRL + V.
If working with only one or two instruments, this is a quick-and-dirty way to approach it, too. So there you have it FL Studio producers! As you can see, there’s lots of different approaches to different situations with copy and paste within FL Studio. If you’re working in Sequencer: only steps copy to steps and MIDI notes copy to MIDI notes. If you’re working in the Piano Roll: only Piano Roll Notes copy to Piano Roll Notes. Take advantage of right clicking to copy and save values when dealing with plugin parameters, automation clips, and other similar tasks. It will allow you to be precise with your values, and not waste time tweaking endlessly just for that extra 1%!